Princess turns one next week, so, of course, I’ve been reminiscing about her birth! That was one crazy day for our family, ending with her making her arrival a prompt 10 minutes after we pulled up to the hospital. Birth stories are all so wonderful and unique in their own ways, I always love hearing about how different children entered the world. So next week, I’m asking you to share yours! 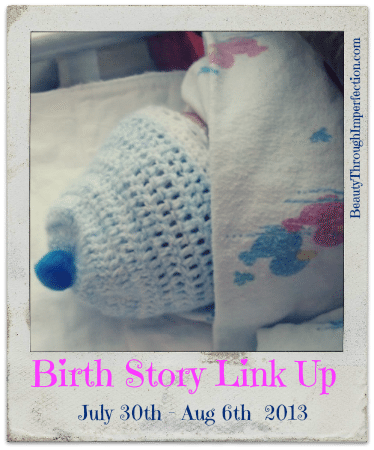 There will be a birth story link up here from July 30th-August 6th. That’s still a week away, so you have plenty of time to write yours out if you haven’t gotten to it yet! Please don’t be nervous about sharing your story, if you want to share it, we want to hear it! I am a firm believer that it is impossible to cheat at childbirth! So regardless of your birthing method, I want to hear it! Even if your birth didn’t go the way you hoped it would, or others thought it should, it is still a beautiful story and it will be applauded here! If you adopted a child and you want to share about the day you brought him or her into your family, those stories are welcome as well! Let’s celebrate the day our precious ones entered our lives! No Drama, No comparisons, No Judging and No rules! Just sharing and rejoicing together! If you would like to add this little button to your post I would appreciate it, but it is not required. Looking forward to hearing from each of you next week! Ps – If any of your little ones are still babies, be sure to check out my post about where to find FREE baby gear! Sounds like fun, Paula! I love birth stories too. My husband often asks what my girlfriends and I talked about at some event, and at least half the time, I can include birth in the list. He can never figure out why we talk about it so much! But it’s endlessly fascinating to me! What a fun link up! I’m looking forward to it! My little guy just turned 2 months old and I need to write up his birth story still. I just hopped over and read your daughter’s story – and goodness does it ever sound similar to my last one. :-) Spencer was born less than 10 minutes after we got to the hospital – in the ER triage. Looking forward to reading all the birth stories. Hey Buddy!, I found this information for you: "*Coming Soon* Birth Story Link Up". Here is the website link: https://www.beautythroughimperfection.com/birth-story/. Thank you.